Next to writing, I love crafting. So, whenever I take a mini-break from the keyboard, I search for fun and easy crafting tutorials on Youtube. I like the kind of crafts I can make in an afternoon. 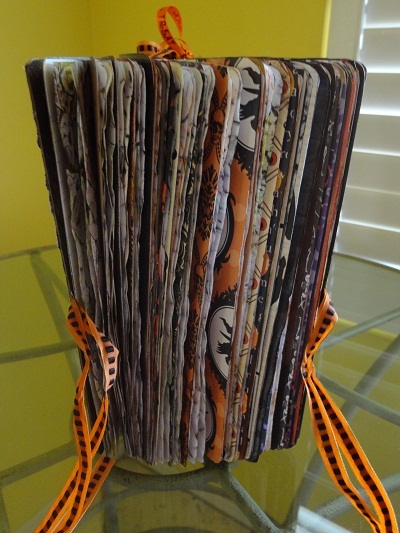 This past summer, while taking a break from editing my novel, “Butterfly Hollow,” I had a blast creating these cool junque journals. So, what’s a junque journal? It’s like a junk drawer tucked away in a book. 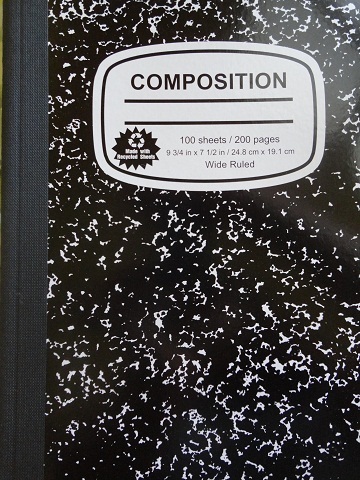 And it starts out as a composition book just like this one. 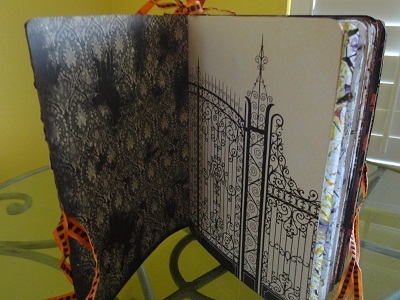 Then, with a little scrapbook paper, glue, ink, and some ribbon it’s transformed into a scrapbook/journal where you can tuck away paper ephemera such as photos, concert tickets, postcards, or anything else flat that can be glued or clipped onto a page. 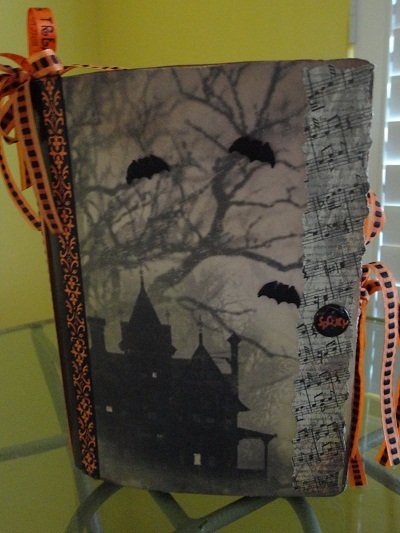 Since I love Halloween, I used all of my favorite Halloween paper and created two journals. I know I’ll have fun filling them up. Junque journals also make great gifts. And with the holidays around the corner, I’ll be sharing a few more with you soon. Here’s my Youtube video featuring both of my journals. Sorry about the rainbow discoloration in my video. My iPad acts goofy sometimes. Do you like to make crafts? If so, what type of crafts do you like to make? This entry was posted in Uncategorized on October 29, 2012 by mariacisnerostoth. I still have to complete my “altered book” journal. I have waaaay too many crafts I like to do. 🙂 Knitting and crocheting take up most of my time these days, but I love to sew and make my own cards too. p.s. 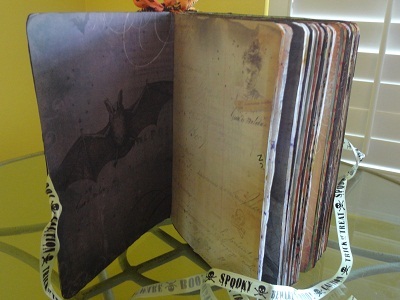 your Halloween Junque Journal is very cool! 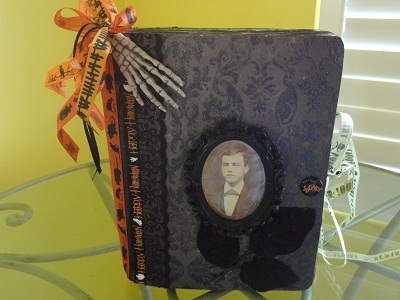 Hi Teresa~I’d love to see your altered book/journal when you’re all done. I have one that I started months ago, but it’s one that will take more than an afternoon, so it sits there waiting to be finished. And I hear ya on having way too many crafts you want to get make. You should see my craft room, and then I keep getting more ideas. LOL! And I admire people who can knit and crochet. I don’t have that talents, but I cherish the memory of my mom crocheting. She made it look so easy! And a cardmaking class in on my list of “things to learn.” I’ve saved all of the cards/invites that my niece made. I love all of the fun, artsy details in them. Though, she stopped making them after her son was born. Guess, she’s just so busy homeschooling and everything. I hate to break it to your niece, but homeschooling gets even busier when the kids are in their teens…ack! LOL! I now have to figure out how to get everything together so that my older son can apply to college next year. And *that* is a tooooon of work! And speaking of needing to do something, I’d better run and get ready. My ride is coming soon to pick me up for my SCBWI critique group tonight! I figure it only get more hectic as homeschool moms prepare their kids for college. As it is, my niece drives quite a distance once a week to take the kids to a weekly class where homeschool kids get together. She’s always so busy. And then she does the couponing thing where she finds all of these great coupons and gets a great savings. She said it’s like a job. But she saves a ton of money. I really admire homeschool moms! When I get around to finishing that altered book, I’ll be sure to post, though, it’ll be awhile. LOL! Hi Maria, wow, I remember you mentioning the junque journal and I was interested to know what it looked like. It looks absolutely great. And professional too. I love it! Crafts? I also make my own cards. They have a crafting product over here called ‘hot fuzz’, a synthetic material in amazing colours, that you iron between paper and it fuses into a sheet. I make our own Christmas card every year, by taking a portrait of the boys in a festive setting and then I decorate the cards with hot fuzz and various other things. I love making cards. My mum too is a crochet-wonder, and before that she used to knit our woollies. I didn’t inherit the gene.